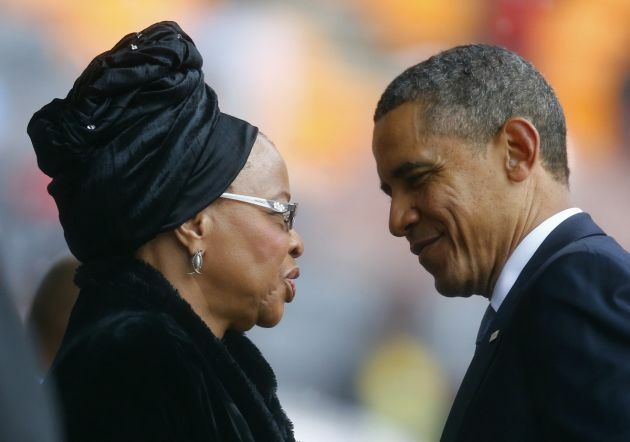 (Photo: REUTERS / Kai Pfaffenbach)U.S. President Barack Obama pays his respect to Mandela's widow Graca Machel after his speech at the memorial service for late South African President Nelson Mandela at the FNB soccer stadium in Johannesburg December 10, 2013. The memorial service for Nelson Mandela at a massive Johannesburg stadium began with interfaith prayers in soaking rain at an event that reflected the ability of the great South African to bring people together even in death. U.S. President Barack Obama was loudly cheered at the Tuesday service saying, "'Mandela taught us the power of action, but also ideas; the importance of reason and arguments; the need to study not only those you agree with, but those who you don't." It was billed as one of the largest gatherings of global leaders in recent history, representatives from around the world joining street sweepers, actors and religious figures to pay tribute to Mandela reported CNN. Bishop Ivan Abrahams, the South African general secretary of the World Methodist Council, said in his sermon at the service at Soweto's FNB stadium, "What brings us here today is not so much grief but love." 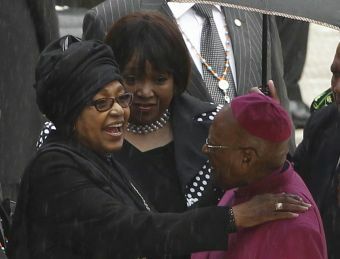 (Photo: REUTERS / Siphiwe Sibeko)Winnie Mandela (L), ex-wife of former South African President Nelson Mandela, chats with former Archbishop Desmond Tutu during the national memorial service for Nelson Mandela at the First National Bank (FNB) Stadium, also known as Soccer City, in Johannesburg December 10, 2013. One Muslim speaker said Mandela never lost an opportunity to reconcile people, "Let us strive towards peace, harmony and reconciliation on the basis of human dignity. "As he stood up to injustice and illegal wars, let us do likewise, even if it is waged by the powerful." Then Thabo Makgoba, the Anglican Archbishop of Cape Town, said "Give us encourage to hold fast to his values, to follow the examples of his practices and share them with the world. "Our hearts are filled with gratitude that you have called Madiba to his eternal rest", he says. "Go forth you revolutionary and loving soul on your journey out of this world. In the name of God who created you, suffered with you and liberated you," he said. The deputy head of South Africa's governing African National Congress, former trade union leader turned billionaire Cyril Ramaphosa welcomed Jewish, Hindu, Muslim and Christian leaders to begin the funeral process. "I apologize for the rain," he said. "We were not able to stop the rain, but this is how Nelson Mandela would have wanted to be sent on. "These are blessings. In the African tradition, it means the gods are welcoming you and the gates of heaven are open," said Ramaphosa, a man slated by some to be a future South African president. "Wipe away the tears of all South Africans and indeed the world," said South Africa's chief rabbi Warren Goldstein comparing Mandela to Joseph in the Bible. The crowd strongly cheered for Zimbabwe's President Robert Mugabe, who unlike Mandela, did not step down after one term but has ruled uninterrupted since 1980, his opponents accusing him of stealing elections and land. They also cheered for the man who the current South African President Jacob Zuma ousted, Thabo Mbeki. But Zuma himself was booed frequently by some of the crowd and Ramaphosa asked the crowd to be disciplined. Some of the crowd said they were embarrassed by the politicking. Zuma concluded his speech saying, "Our father, Madiba, has run a good race. Rest in peace our father and our hero." The crowd also warmly welcomed F.W. de Klerk, South Africa's last white president. Twenty years ago on December 10, 1993 De Klerk who released Mandela from jail after 27 years jointly received the Nobel Peace Prize with the anti-apartheid icon. President Obama shook hands with Cuban President Raul Castro in a gesture of friendship seen as many in the crowd as fitting at the memorial service for Mandela who was released from prison at what was thought to be the end of the Cold War. Some of the loudest cheers were reserved for Obama who said "To the people of South Africa - people of every race and walk of life - the world thanks you for sharing Nelson Mandela with us. "Your dignity and hope found expression in his life, and your freedom, your democracy is his cherished legacy." Obama noted, "'It took a man like Madiba to free not just the prisoner, but the jailer as well." Anglican Archbishop Emeritus Desmond Tutu, a fellow Nobel Peace Prize laureate was one of the last people to speak and he reprimanded some of the unruly part of the crowd. "I want to show the world we can come out here and celebrate the life of an icon," said Tutu. "You must show the world that we are disciplined. I want to hear a pin drop." Tutu said "We promise God that we are going to follow the example of Nelson Mandela."